Last night’s launch of the Sound of Adamsdown CD was a great success, with live performances of “Crystal Moment” by Dominique Fester and “No Blinding Light” by Steve Wride. But now we need to step up a gear to bring this fantastic album to the attention of the wider world. You can help by playing the songs at reverbnation to get the CD up one of the most important internet charts. Mentions on social media such as Facebook, Twitter and any relevant forums are also important. So far the CD has received coverage on Radio Cardiff, the Cardiffian website and Wales Online. But it is a major disappointment that bigger players, in particular the BBC, have shown no interest in the project. The mass media are happy to report riots and other bad news in impoverished inner city communities, but are clearly not so enthusiastic to publicise a positive achievement of one such area. Can anyone seriously argue that there is no track on This is the Sound of Adamsdown good enough to play on BBC Radio Wales? Do feel free to drop the BBC a line about it. CDs are still available at the Communities First office on Moira Terrace, several shops on Clifton Street and many online retailers. All profits will go towards future Community projects. 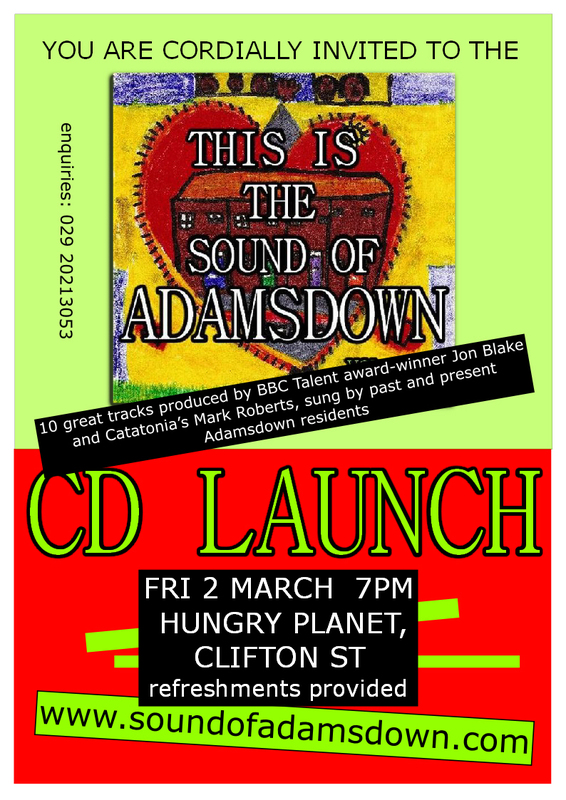 The official launch of This is the Sound of Adamsdown will take place on Friday 2nd March, 7pm, at Hungry Planet on Clifton Street. We’re hoping to have a few live performances and refreshments will be available. Following the launch we’ll be organising a full-on promotion to ensure this fantastic CD gets the audience it deserves and puts Adamsdown, Cardiff on the map – just as Adamsdown Song received fan messages from all over the world. Anyone wanting to review the album is welcome to pick one up at the launch. All performers, their friends and families, as well as anyone from the media interested in the CD, or indeed anyone interested in promoting it or getting involved in any way, are welcome to attend. We’re particularly interested in meeting anyone interested in making videos of the songs, or shops and stalls interested in selling it. Shops keep £2 of the £5 selling price and can get the CD sale or return. All profits from the CD will go to a fund for future creative projects in Adamsdown. This is the Sound of Adamsdown is already for sale at Hungry Planet and is now available for download at Amazon. Keep spreading the word! Mentions and links on social media are invaluable.